The Solitaire Desert Farm received a Gold Award of Excellence in 2015 and 2016, plus two previous HAN Silver Awards. 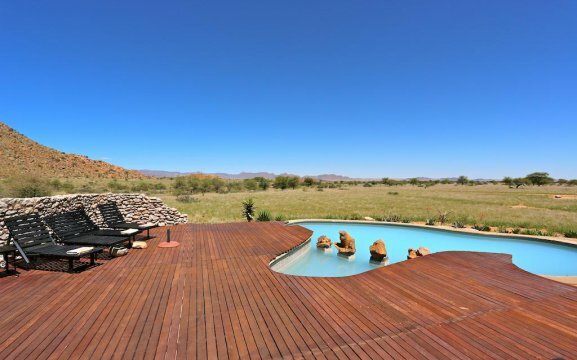 It’s located just 7km from Solitaire and is an intimate guest farm tucked into the Rand Mountains with amazing views over the Namib Desert. With lush gardens, it features an open thatch restaurant with outdoor seating, two swimming pools, a garden and a bar. We offer laundry service, free Wi-Fi in public areas and braai facilities. Wild animals in Solitaire include oryx, kudu, springbok, mountain zebra and the bat-eared fox. 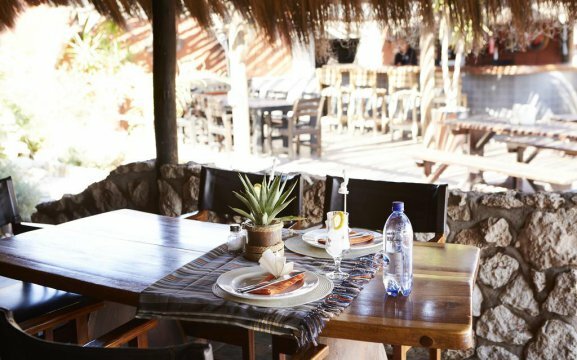 In our restaurant, we serve delicious breakfasts and dinners underneath a traditionally thatched lapa. 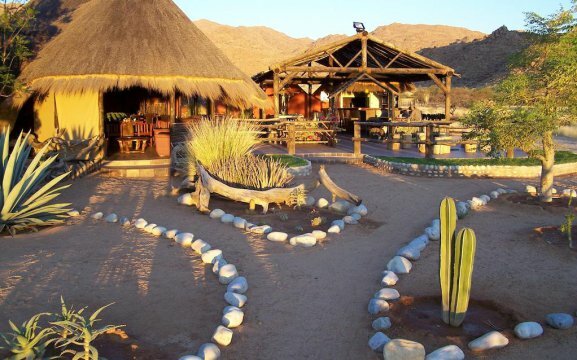 Our Desert Farm offers en-suite rooms, a self-catering house and campsites. 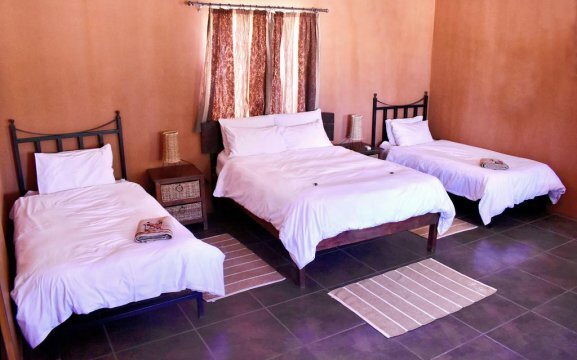 All rooms are spacious air-conditioned with en-suite bathrooms. They all feature a private deck, free toiletries, an outdoor shower, a ceiling fan and lounge. 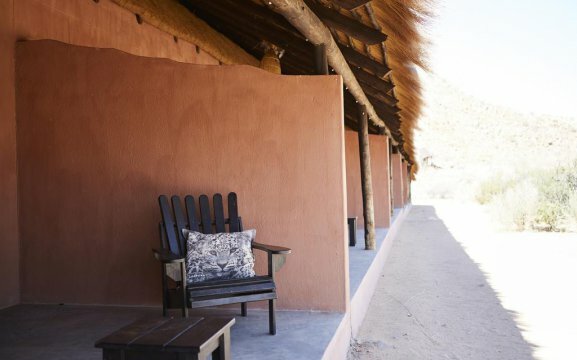 The self-catering house includes a fully equipped kitchen and dining area, lounge and veranda overlooking the beautiful Namibian sunset, braai facilities and an outside bush shower. Our campsites include packages with breakfast, dinner, activities and pool use. 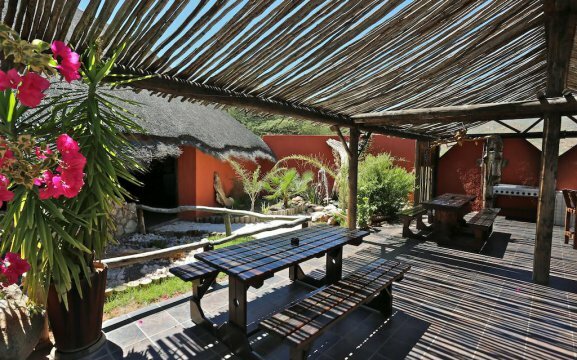 They have a spectacular view with shade huts, braai facilities, electricity and bathrooms. Guests can experience Africa’s wilderness on our “Night Drive” and see the miraculous mountain that looks like a human skull. 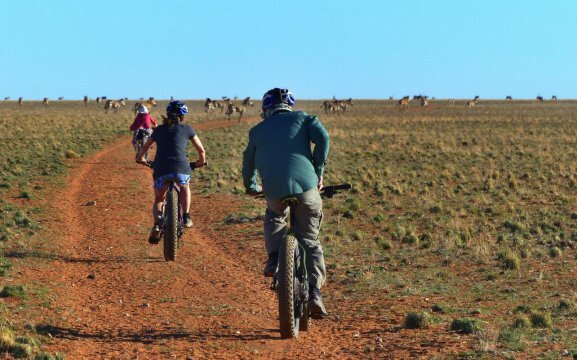 Visit the Sesriem Canyon and Sossusvlei or the Naukluft Mountains and three passes – Spreetshoogte, Remhoogte and Gamsberg. 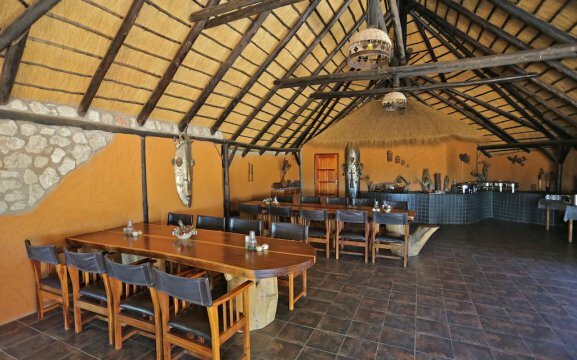 We also have hiking trails, game drives and the Namib Carnivore Conservation Centre.